Oxidized & texturized silver metal & hand coiled wire. Some designs incorporate antique buttons. Manipulating molten glass, I create glass elements which I use to design unique jewelry. 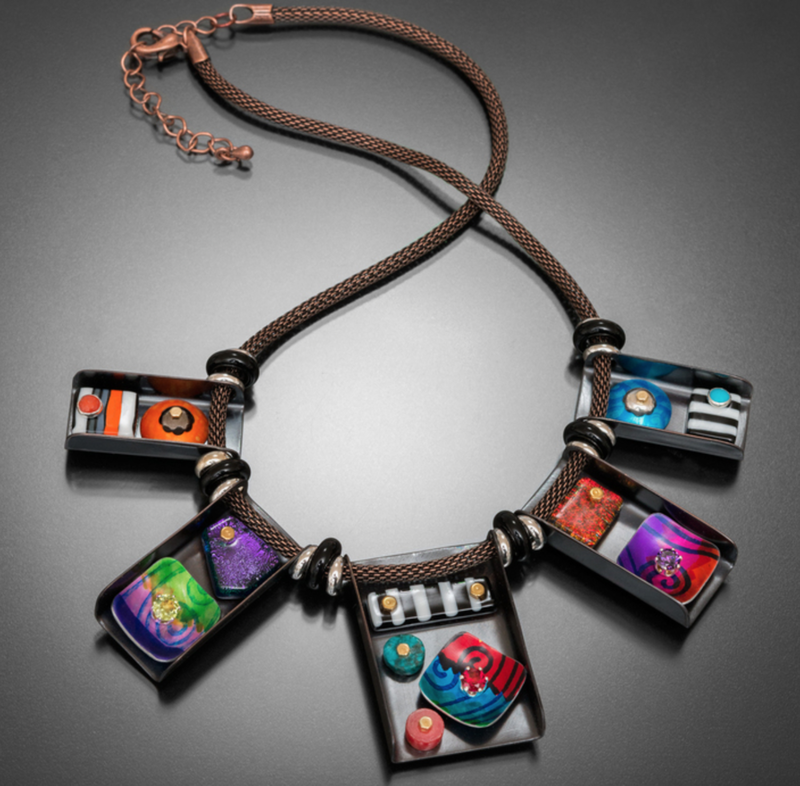 Techniques used include glass blowing, flame-working, cold work, Mokume gane and acid etching. I create bold, dramatic designs featuring yellow, white & red gold, diamonds & gemstones. I use lost-wax techniques enhanced with hand fabrication to create a fusion of the natural and architectural. I hand build each setting for my silver jewelry. I use a construction process with sterling sheet, wire, and tubing. 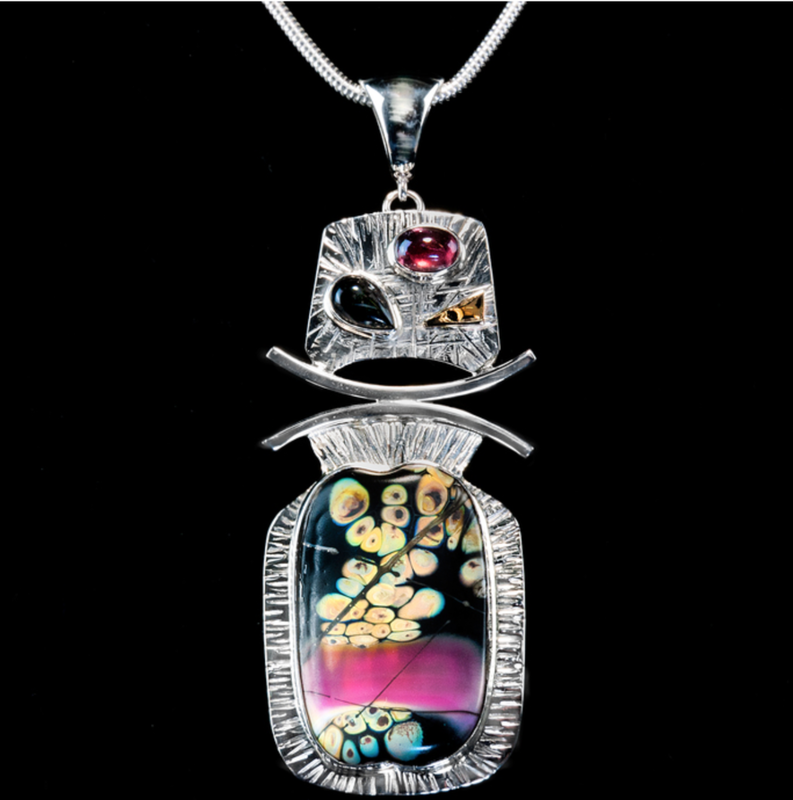 Gemstones of the highest quality are incorporated. 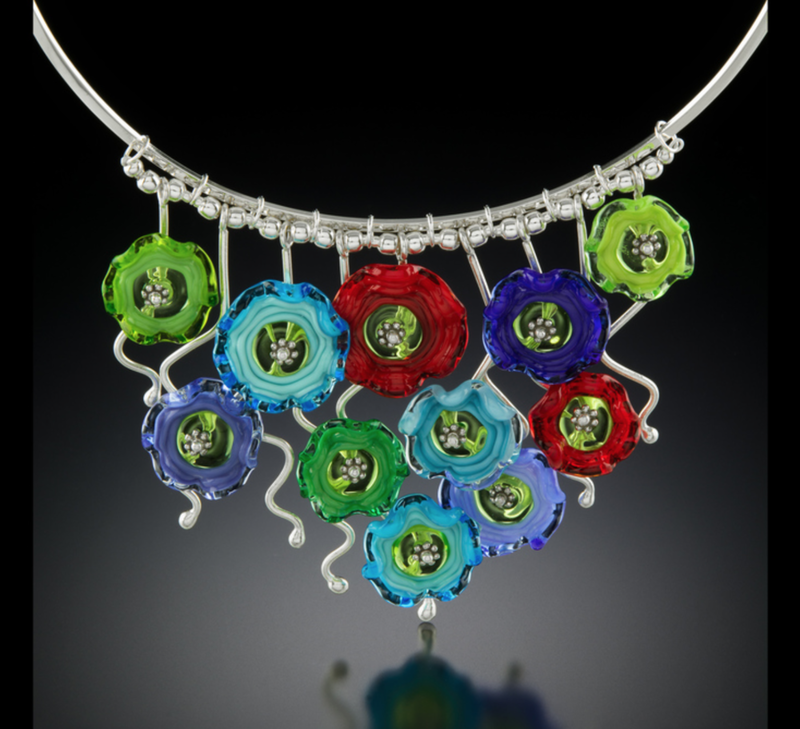 We use the ancient technique of cloisonné enamel, firing 10 or so layers of powdered glass onto silver, to create colorful components. We set these in sterling silver and embellish with gold and gems. Each piece of jewelry that I create is a miniature sculpture designed and made to be worn. All work from the initial design to the final polish is done by myself without any outsourcing or CAD. 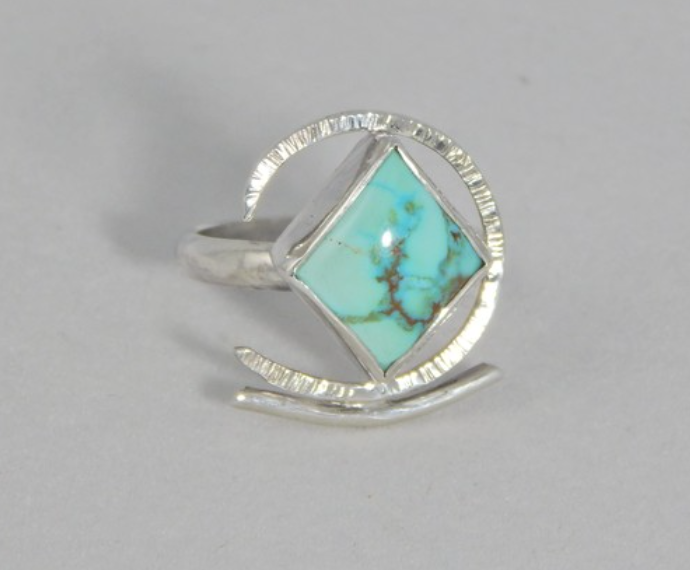 Sterling silver, bronze, brass and/or copper metals are woven or knitted together and embellished by focal pieces featuring fused and/or granulated silver and bezeled cabochons. Combination of black & white photography & oil painting. My film photos are printed in my darkroom & handpainted using vibrant oils of my color choices revealing the fine details of the photograph. 6 steps transform upcycled surfaces. Next they're painted w/ a custom 25 color palette using shapely brushstrokes. Then layered w/ transparent glazes. High quality UV protectant seals for outdoor use. Multiple layers of stitching, heat set textile paint, charcoal,watercolor and oil pastels on raw cloth that has been cut, sized and frayed then mounted on custom made frames. Fiber dyed using traditional batik methods to achieve detailed image. Encaustic wax added to enhance texture and detail. Asian assemblage, composition fiber embellished w/recycled Asian antiques presented as a painting. Modern take on bas relief. Digitally designed, CNC carved, 3D wood wall art. Hand painted with acrylics and hand finished through unique fire torching and hand distressing. Wildlife of North America is carved in very decayed wood and then cast in both white bronze and pewter or a clay made from mesquite wood. Metal oxides are applied for colored accents. Feathers masks with Totems done with venetian plaster. Art furniture and wall sculptures, all heavily influenced by nature, carved from exotic hardwoods and live-edge slabs, with fired-glass accents. My art is a unique combination of painting, illustration, and photography. Oil & mixed media on stretched canvas applied in numerous layers of adding and subtracting give this piece a highly textured look. My work is mixed media on wood panel with a blend of unique proprietary plasters as a foundation. Then I use latex paints, glazes and various clear coats. I create hand-cut stencils for the imagery. Hand formed copper wall sculpture using wood, stone and other organic materials. as a third generation metal smith, i use my Grandfathers' hand tools to create dimensional and focal sculptures. With Oil pastel on textured board I create Art That Makes You Laugh©- the medium is not the message- it is the humor that distinguishes my art from all others. I belong in Other. Thank you! We'll keep you up to date.